3D Vision fix for World of Final Fantasy, with some post processing toggles that work when you enable post processing in the launcher. - A problem with ambient occlusion at resolutions higher than your monitor supports. - Download this file and extract its contents in the "WOFF" folder, where "WOFF.exe" is. - Run the game and let it overwrite the profile the first time. - 1 (not the numpad) or XB_LEFT_THUMB: quick toggle to adequate (low) convergence and HUD depth for cutscenes. The default convergence and HUD state is best for gameplay. - F2: HUD depth presets. 40% depth by default. - F4: depth of field toggle. Not disabled by default. I recommend this hotkey, because the effect is usually overdone. - F6: FXAA toggle. Not disabled by default. - The game support SBS/TB Mode using 3Dmigoto. Remove the ";" in the ";include = ShaderFixes\3dvision2sbs.ini" of the d3dx.ini. F11 to cycle. Also remember to use "HDMI Checkerboard" in the NVCP to remove the 720p limitation. - Outlines objects are 2D....fix it for some reason remove some shadows. masterotaku - for guiding me with his knowledge and be present all the time for my questions!!!! THY MATE!!!! maurizioclaudio21 - a BIG THANK YOU goes out to you from germany (Thuringia) for all your testing and supporting me finding issues in the WIPs !!!!! ==> NOTE: FOV 80 has issues, i do not suggest it!! !, FOV can be selected via the starting script. - gamestart without the script possible, see section 4.1 for instructions! - make sure you start the game EVERY TIME via "0MetroExodus_3DVision.exe" as Administrator! ==> If you have any trouble or issues you cannot solve please use DDU and make a clean driver installation/reinstall game/reinstall fix after uninstall.cmd .... but do not hesitate to contact me via my PayPal donation address or in the 3D-Vision-Forum if you are sure you have double checked all the instrucions and still have problems!!! - add r_dbg_stereo_auto_separation 0 @ the end of the file, you HAVE TO do this every time you relaunch the game!!!! to unlock convergence!!! - DO NOT WRITE PROTECT THE user.cfg!!!!!!!!!!!!! - cycle HUD depth, ALSO afflicts crosshair!!! - disable blue light of your arms clock that may be annoing, also disables lens reflect!!! - "o" / "XB_LEFT_TRIGGER" / "RBUTTON" / "p" / "*" / "F1"
3D Vision fix for Soulcalibur VI, using the UE4 universal fix as the base (credits to DHR for the universal fix). - Character shadows when doing super moves. - Realistic specular reflections, with some exceptions for effects that look worse with it. - HUD at depth with fixed clipping. - In Yoshimitsu, Ivy and Geralt super moves, there is a bit of 2D smoke that I couldn't identify as a shader. - HUD text shadows can have some more depth than the text itself, when the HUD is placed at depth. - Download this file and extract its contents in the "SoulcaliburVI\SoulcaliburVI\Binaries\Win64" folder, where "SoulcaliburVI.exe" is. - IMPORTANT: in the ingame options, choose exclusive fullscreen. - 1 (not the numpad): convergence presets. - XB_RIGHT_THUMB (right stick click): low convergence toggle, recommended for super moves and cutscenes. - F4: bloom toggle. Not disabled by default. TAW is an old 1998 directx 5 game, made to run with 3Dfx Glide boards to get its best. It have one of the best compromise between Dynamic Campaigns and a sim playability until today. This is why we love it. Today, to run it well and with good resolution we need a Glide wrapper. This last dgvoodoo2 runs it at Dx11 and with the same good visuals as an old 3Dfx glide board. Being "now" a Dx11 game, 3Dvision and 3Dmigoto can push it to a real stereo 3D game! Just a impossible thing before. 3. These two mod files. Note that you will not install any wrapper by the TAW Menu (taw launcher) - it will be replaced by the new one that you download above. If you already have installed any by the TAW Menu (taw launcher) just set as above that it will be uninstalled automatically. C. Unzip dgvodoo 2 2.45 at any place on your computer (can be, but not mandatory, on the F-22 TAW install folder itself). 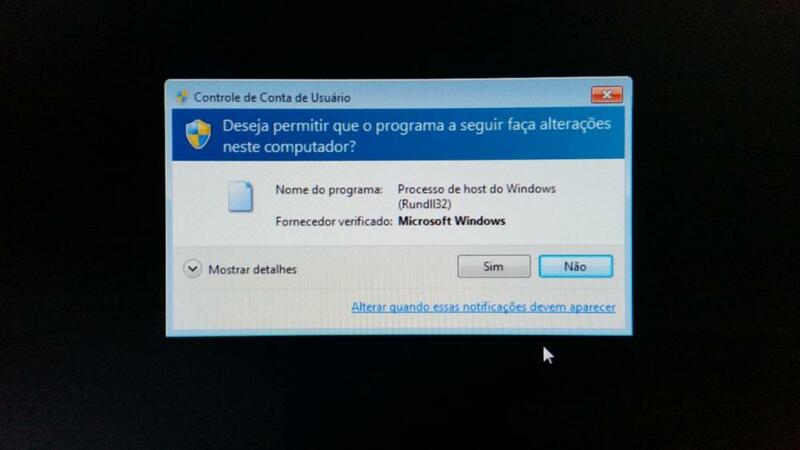 Run dgVoodooSetup.exe once (from the folder that you unzip dgvodoo 2 2.45) and set as the pic below. Then close it. Note that both Nostalgia mod and Objects Max Draw Distance mod in this pic are totally optional (comes with the F-22 installer and are optional). 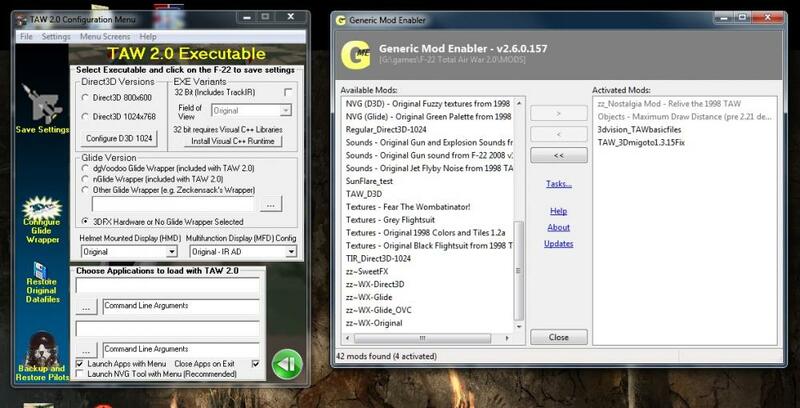 BUT ALWAYS enable the two 3Dvision mods for last. TAW_3Dmigoto1.3.15Fix install 3Dmigoto v1.3.15, the Vertex Shaders that fix the game and d3dx.ini that have the special key profiles among others few files. E. Now install Nvidia Inspector i(f you yet don't have it installed). Just allow it, enters into the game and quit. After that you probably already have a Nvidia Profile for TAW as below. 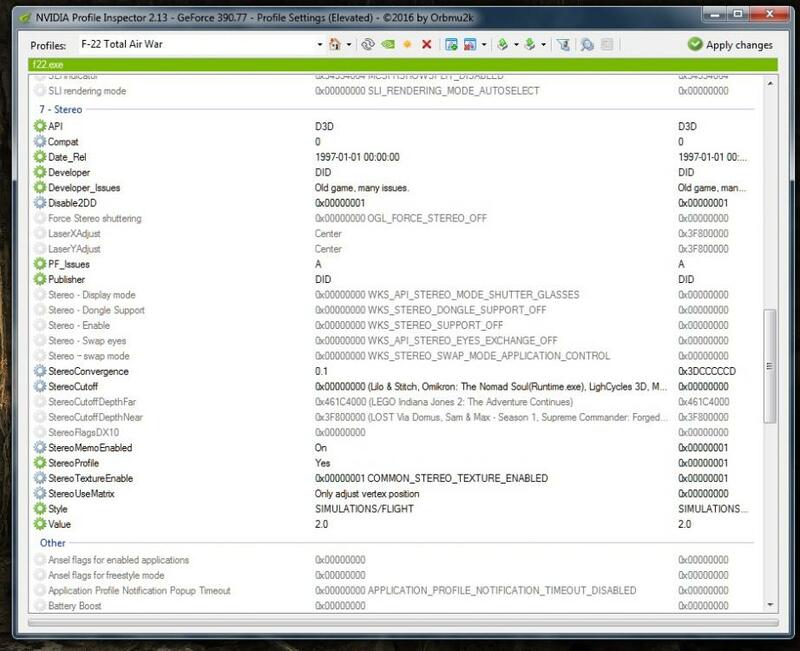 Open Nvidia Profile, locate and open the F-22 Total Air War profile and adds the f22.exe as its executable if it is not already ( not _f22.exe, pay attention!). This f22.exe was installed from the 3dvision_TAWbasicfiles mod that you did on the "D" section just above. See the pic below . Note the f22.exe at the first line (again not _f22.exe!!!). The settings on this pic are my suggested settings for TAW profile to get the best image into the game. Dgvodoo 2 2.45 will run TAW in dx11 so AA will not work from the profile. But these sets are enough to give to the game a excellent visual. Note that dgvodoo itself will apply 8x AA to the game. If you yet don't have these sets above, just run the game again and it must do it automatically. Well that is it. Now when running the game at any time in mission (3Dvision will not kick in at menus) press Crtl+T and the stereo magic comes in. A doubled image will appears. Just put your stereo glasses and see it! 2. 3Dmigoto is a wrapper that allows us to fix the vertex and pixel shaders that are not fixed automatically by 3Dvision drivers. It also allows us to create complex profiles that automatically changes things like convergence/separation for different scenes of the game like cockpit, external views, MFDs, etc. Also some new special keys and functionalities can be added to the game. So, 3Dmigoto will changes automatically TAW convergence for your eyes confort when into cockpit or external views or even for MFDs views. Also the HUD and any other Text in game will be adjusted automatically, providing always a good and comfortable 3D view. So no need to use these below keys but they are here if you need them eventually. - Key Ctrl+PgUp: allows the holograph mode. This is a plus on this fix. The Plane on external views will seems to fly out of your monitor! Looks a model toy and seems that you can catch it with your hands. Very cool!. And the game is totally playable too. - Key Ctrl+PgDown: turn all text off. Good for look at the game in external views with clean screen. Also to make pics. Note that the game already have a key that adjust the HUD on off for the same effect in cockpit views. - Key Ctrl+0 (zero): brings more convergence to the game. The 3D effect is yet better. Useful for external views and can be used also on holograph mode. - Key Ctrl+F10: resets 3Dmigoto profile if anything goes wrong. The convergence is set to cockpit standard for safety. Well, nothing is perfect, some effects aren't find in Vertex or Pixel shaders and can't be fixed by 3Dmigoto - or at least by me :). So these are partially or totally disabled automatically when running in real stereo 3D and will not affect the gameplay neither you will really notice them. Running a game in a real stereo 3D make it much better in immersion and beauty. And TAW is not an exception! Good hunt into the sky!